Written and Recited before the Congress by Mr. Frank L. Stanton, of Atlanta. From the northland, the eastland, the west. Rest here on her breast. In your states, in your honors, your names. And the wreath on your foreheads is fame's. All the people of Atlanta—and, indeed, of Georgia—were, in a certain sense, represented in the invitation extended us by their Governor and city authorities. The organized bodies that joined in the invitation include in their ranks nearly all the prominent and public-spirited men of Atlanta. It was, therefore, not surprising that from the beginning a lively general interest in the Congress was manifested by the best elements of the city. 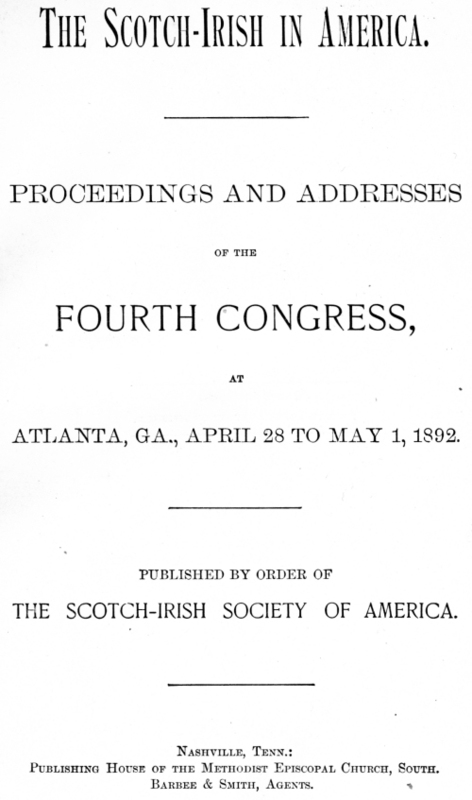 The Scotch-Irish Society of Atlanta, however, took the lead in making the arrangements for our entertainment. A finer body of men than they no city in the land can muster. This Society was organized in April, 1890, during a visit which Dr. John S. Macintosh and Col. John W. Echols, representing the National Society, made to Atlanta for that purpose. During most of the time since its organization, Rev. Dr. J. N. Craig has been its President, and until his removal to Texas in the summer of 1891, Mr. W. Hugh Hunter was its Secretary. To Mr. Hunter in largest degree was due the permanent organization and first considerable accessions to the ranks of this splendid body. 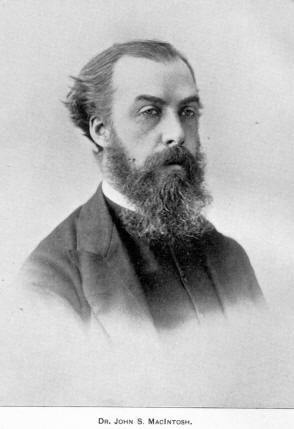 Of pure Scotch-Irish blood himself, and with a strong conviction of the importance of his work, Mr. Hunter threw into his efforts an energy and enthusiasm which could not fail of success. After his removal to Texas the work was taken up and has been carried on with the same gratifying progress by his successor, Mr. T. H. P. Bloodworth, the present Secretary. This Society appointed special committees of arrangements for the Congress, selecting partly from its own ranks and partly from the other organizations that joined them in the invitation. The supervision of all the arrangements was imposed upon an Executive Committee, consisting of Dr. J. N. Craig, Chairman; Mr. T. H. P. Bloodworth, Secretary; Judge W. L. Calhoun and Col. H. F. Starke. Dr. Craig is at the head of the Home Missions of the Presbyterian General Assembly, a leader in the counsels of his Church; and, what is not generally expected of a clergyman, is a man of rare executive ability. Mr. Bloodworth is a successful business man, with the characteristic energy and ability of his race. The name of Calhoun is a household word, but not on account of the great family to which he belongs so much as because of his goodness of heart and vigor of intellect is Judge W. L. Calhoun the idol of an admiring constituency. Col. H. F. Starke is the grandson of the revolutionary hero, John Starke, and in him do the qualities of his illustrious ancestor live again. The names of all the committeemen are given in the pages immediately following this article, but special mention is due Capt. G. B. Forbes, Chairman of the Invitation Committee, whose address in this volume breathes the spirit of fraternity which we are striving to cultivate; to Mr. J. C. Kirkpatrick, Chairman of the Finance Committee, whose respected name and influence, as well as his personal efforts, enabled the committee to secure the necessary fund for expenses; to Col. J. R. Whitesides, Chairman of the Committee on Halls, for his untiring efforts to provide for the comfort of visitors; to Col. Lavender R. Ray, Chairman of the Committee on Speakers; and to Mr. J. L. C. Kern, Chairman of the Committee on Music. For several months before the date fixed for our meeting these gentlemen devoted themselves to the preparations for the event. The arrangements were projected on a most generous plan and were carried to the most satisfactory completion, as will be seen by reference to the report of the Executive Committee, published in another part of this volume. The officers of the Society began to arrive in Atlanta the first days of the week of our meeting. The members, many of them with their wives and daughters, continued to come during the entire week until a goodly crowd of representative Scotch-Irish people were present from every section of the nation. It may be said, without disparagement to the cities which have heretofore entertained us, that the arrangements for sight-seeing and social entertainment were, in many respects, superior to those of our meetings in former years. This was due, in some measure, to improvements in our programme, suggested by experience, and to the superior facilities of Atlanta as a convention city. The Kimball House, one of the largest and best-equipped hotels in the United States, was the official headquarters. Within its capacious walls were gathered the bulk of the visitors from a distance. Situated in the very center of the city, every point of interest in and about Atlanta is easily accessible from its doors. The principal social event of our stay was the reception tendered the Congress at the Gubernatorial Mansion by Gov. and Mrs. Northen, who are themselves the highest types of Georgia's manhood and womanhood. Within the halls of this historic mansion the brilliant throng assembled was entertained with a genuine warm-hearted Southern hospitality which will not soon be forgotten. The social attention which we received did not end here, however, but continued to the hour of our departure. The freedom of the city was tendered us by Mayor Hemphill at the beginning, and it was no empty compliment. Every one, from the Governor down, seemed delighted to contribute to our pleasure, and the result was a week of the completest enjoyment. The exercises of the Congress were held in the Hall of Representatives of the state Capitol. This magnificent building has been completed only a few years, and is a source of just pride to Georgia. The hall in which we met is a perfect audience chamber for our purposes. Our usual Sunday service was held in the afternoon instead of at night, as heretofore. DeGive's Opera House was chosen for this meeting, because it was the largest auditorium in the city. It was crowded to its utmost capacity, and the same profound religious impression was made that characterized the similar services held at Pittsburg and Louisville in 1890 and 1891. The far-reaching and elevating influences of these services cannot be estimated. The national Society has no part in making the arrangement for these meetings. They are entirely under the control of the local committees, who have, year after year, by common consent, chosen Dr. John Hall, of New York, to deliver the sermon of the occasion. His towering form seems to suffer nothing from the ravages of time, and his great powers of mind and heart grow with the years, and draw men heavenward with greater and greater strength. The report of our Executive Committee, in succeeding pages, reviews the progress of our Society during the year ending at Atlanta, and it would be needless repetition to set it forth again at this place. Suffice it to say that we are moving steadily on to the accomplishment of our high purposes along the lines laid down at the beginning. The rapidity and scope of our progress in the future will depend upon the continued interest and work of our individual members. It is earnestly hoped every member of the Society will endeavor to bring into our ranks during the year a number of his friends, and that we may close the year with the best record of any in our history. Springfield, O., will be our next place of meeting. The date fixed is May 15-18, 1893. Springfield is situated in the heart of one of the most populous, fertile, and beautiful sections of the United States, and is rich in historical incidents of special interest to the Scotch-Irish race. It is forty-four miles southwest of Columbus, eighty miles northward of Cincinnati, and one hundred and thirty-five miles eastward of Indianapolis. Through its railroad systems, the Pennsylvania, the Big Four, the N. Y., P. and O., and the Ohio Southern, and their connections, it is easily accessible from all directions. Excursion rates will be had over all the railroads. Springfield has about thirty-five thousand inhabitants, largely engaged in the manufacture of agricultural implements, in which it is easily ahead of the world. Its people cannot be excelled in warmhearted hospitality, and all visitors will receive a royal welcome. Mr. George H. Frey, of that city, will be glad to furnish information relating to Springfield and the arrangements for the Congress to all who may desire it. Mr. Frey is one of the most honored citizens of Springfield, and to his influence principally is due the selection of that city as the place of meeting. The early announcement of the time and place of meeting it is hoped will enable us to secure a larger attendance at our fifth Congress than we have ever yet had. The Scotch-Irish of Atlanta. By Col. G. W. Adair, of Atlanta, Ga.
Three American Ideals—The Puritan, Cavalier, and Scotch-Irish. By Henry Alexander White, M.A., Ph.D., D.D., of Lexington, Va. The Georgia Cracker. 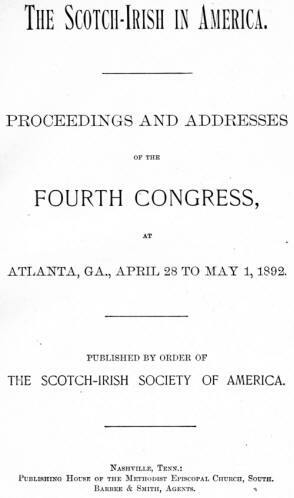 By Maj. Charles H. Smith (Bill Arp), Cartersville, Ga.
Scotch-Irish in Georgia. By Hon. Patrick Calhoun, of Atlanta, Ga. The Scotch-Irish in America—Who are they? and what are they? By Dr. A. Given, of Louisville, Ky. The Inventors of the Scotch-Irish Race. By Dr. John H. Bryson, of Huntsville, Ala.
An Early Ulsterman. By Mr. George H. Frey, of Springfield, O.
Scotch-Irish Homespun, and Acts of the Scotch-Irish Fathers. By Rev. H. Calhoun, of Mansfield, O. By Rev. Henry Quigg, D.D., Conyers, Ga.
By Rev. Samuel Young, Allegheny City, Pa.
By Col. I. W. Avery, Atlanta, Ga.
By Judge Hamilton McWhorter, Atlanta, Ga.
By Capt. G. B. Forbes, Atlanta, Ga.
By Hon. David D. Roper, Slatington, Pa.
By Mr. Helm Brace, Louisville, Ky.
By Judge James B. Gordon, Philadelphia, Pa.
Shamrock and Thistle, a poem. By Mr. Charles Hubner, of Atlanta, Ga. Closing Religious Exercises at DeGive's Opera House including Dr. John Hall's Sermon. Andrew C. Black, Springfield, O.
Col. William M. Irvine, Richmond, Ky.
Dr. J. M. Deaver, Lancaster County, Pa.